A review in 10 words (or thereabouts): "Inconceivable." 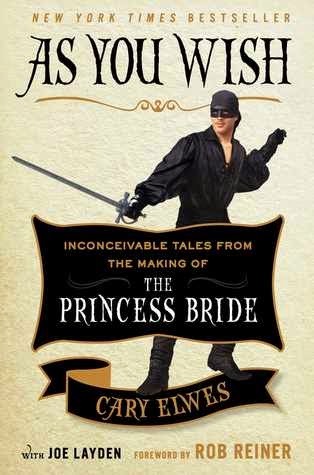 From actor Cary Elwes, who played the iconic role of Wesley in The Princess Bride, comes a first-person account and behind-the-aches look at the making of the cult classic film filled with never-before-told stories, exclusive photographs, and interviews with costars Robin Wright, Wallace Shawn, Billy Crystal, Christopher Guest, and Mandy Patinkin, as well as author and screenwriter William Goldman, producer Norman Lear, and director Rob Reiner. I can't tell you when I first saw The Princess Bride. I know I was blessed with parents who appreciate fun 80s movies, so as a child of the 80s I know I was probably fairly young. But I do know that it only took one viewing to put it at the top of my favorite movies list where it has stayed into my adult years. There's something whimsical, timeless about the movie that begs for repeat viewings, and the movie is so funny that it can be appreciated over and over again. And quoted. Oh how it is quoted. By golly we even presented our own adapted version as a homeschool play! Instead of kissing there were high fives...Fezzik the giant was played by the shortest kid in the room...but every single kid who participate loved it just as much as we did, and still identify themselves with the fun program to this day. So I was terribly excited when Westley himself released this memoir about his time working on the film. There are stories that will make you laugh. Stories that will make you cringe. And there are stories that will make you fall in love with the movie all over again. I watched it three times last week with a whole new appreciation. And that's the thing. For some reason, it was really nice to hear that the experiences of the cast and crew match the love that the movie knows in pop culture. Sure, it was a job, but those who were a part of the film appreciated what they were doing and appreciate still today how families are sharing the movie through generations. Else writes about the movie with love, and the snippets from other cast and crew mirror his affection. For any fan, this is a great read.